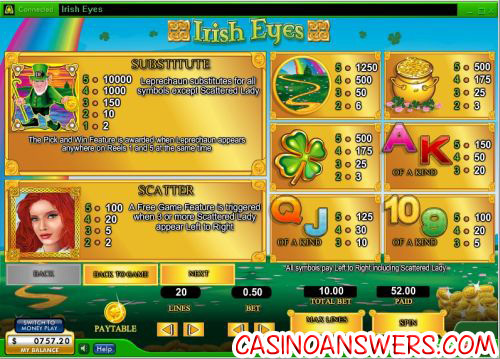 Irish Eyes Video Slot Guide & Review - Casino Answers! Irish Eyes is a 5-reel, 20-line video slot found at Random Logic online casinos, featuring scatter wins, wild substitutes, a free spins feature and a pick and win bonus feature. 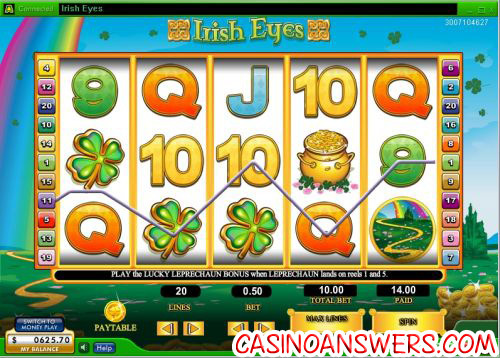 You can play the Irish Eyes slot machine at Lucky Ace Casino and Littlewoods Casino. To play the Irish Eyes slot game, set your bet at one of the following coin values: $0.05, $0.10, $0.20, $0.25, $0.50, $0.75, $1, $2, $4 and $5. This will be your bet per line. You can also adjust the number of active paylines (between 1 and 20). The minimum bet on the Irish Eyes slot machine is $0.05 and the maximum bet is $100 per spin. When you’re ready to play Irish Eyes, you can use “Max Lines” to play the game with all 20 paylines active or “Spin” to play the game with the current settings. The Irish Lady symbol is Irish Eyes’ scatter symbol. When three or more Scattered Lady symbols appear left to right, you will win 12 free spins and a 3X multiplier. All of the prizes in the free spins feature are tripled. The feature can be re-triggered. Free spins are played at the lines and bet of the trigger game. Free spin wins are added to payline and scatter wins. The top jackpot on the Irish Eyes slot machine is the Leprechaun symbol – worth 10,000 coins when you hit five of these symbols on an active payline. The Leprechaun wild symbol will substitute for all other symbols in Irish Eyes except for the Scattered Lady symbol. When Leprechaun wild symbol appears on the first and fifth reels at the same time, you will trigger the Pick and Win bonus game. The Leprechaun symbols will now have prizes behind them. Pick one to reveal a prize. You may even be awarded a second pick. You can win up to 1000 times your triggering bet. You can trigger the Pick and Win bonus feature in the free spins feature. Irish Eyes is a video slot with a good top jackpot, a simple but effective bonus feature and a free spins feature with a sweet multiplier. To play the Irish Eyes video slot, sign up and make your first deposit now at Lucky Ace Casino. Are US players able to play the Irish Eyes casino game for real money? Unfortunately, US players cannot deposit and play at Random Logic casinos, so they are unable to play Irish Eyes for real money. For a US-friendly Irish-themed video slot, please read our Lucky Last Irish Video Slot Review. What casinos have the Irish slot machine?